When we moved to Bangkok a year ago and started apartment hunting, we realized that most places lacked a room that is usually considered essential – the kitchen. The first few apartments we saw had a tiny refrigerator and a small outside kitchen, and I use that word loosely, because the “kitchen” was merely a hot plate and sink. After seeing a handful of apartments like this and becoming totally confused, we did the only sensible thing: we sat down for a beer then went to see our expat friend for help. We learned that many cheaper apartments in Bangkok don’t really have kitchens and the local people are fueled by street food. 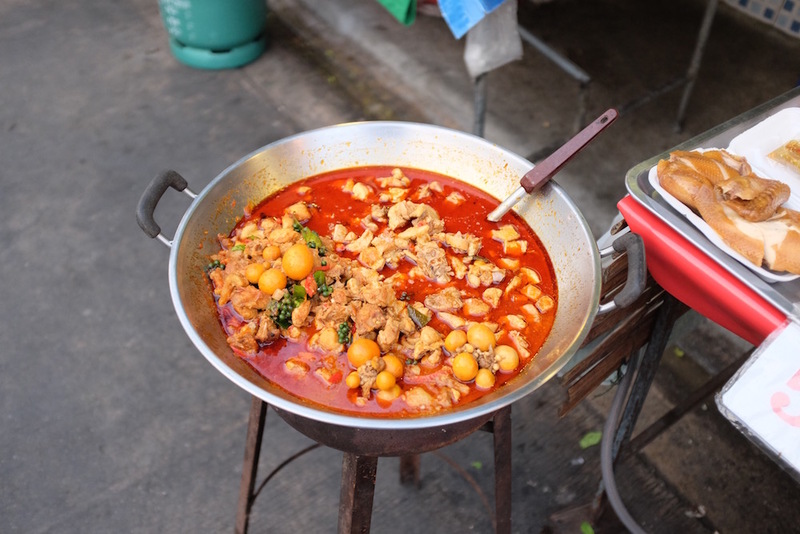 All through town vendors on sidewalks, in parking lots, or in ramshackle markets have big vats of curry, giant pans of stir fry, fresh salads, and grilled meat for sale. Most people get the food to go, but some eat at make-shift restaurants with folding chairs and cheap tables. 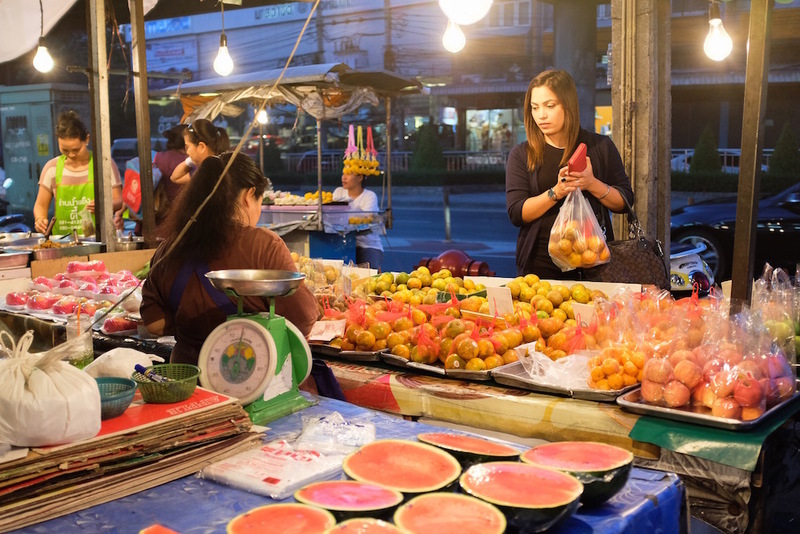 The street food is always fresh, bursting with flavor and shockingly inexpensive. Street food is so cheap, it is actually more affordable to eat out every meal than it is to eat at home. To give you an example, there is a lady near our house who charges 40 Baht – 1.13 USD! – for a plate of pad thai with shrimp. She makes the meals to order from fresh ingredients she bought from the market that day. I seriously have no idea how she makes any profit! A typical street food restaurant – grilled meats, salads made to order, tables and chairs in the road, stray dog. Our neighborhood is about 10 miles from downtown, far from the tourist areas. I have to be careful what I eat here because the curries the locals eat melt my face off. There is a woman down the street who sells curry in front of her house. She makes her curry broth from molten magna and spices it with bear spray yet it is somehow delicious, even though it commits unspeakable violence to my mouth. On the flip-side, food in the tourist areas is dumbed-down for foreigners and is too bland for me now. To make matters worse, it is grossly overpriced. When we go downtown, I become that cranky, jaded expat that complains about the bland food, high prices and dirty backpackers wearing elephant pants. Although our neighborhood is loaded with great street options, we end up eating at a tiny little restaurant called Little Savoy 3-5 times a week. Most of the dishes on their extensive menu cost between $1.75 to $3 and everything is delicious. We don’t speak much Thai and the ladies there don’t speak much English, but they are like family because we see them so often. I almost never get tired of Thai food, but it is nice to eat western food at times. There are some excellent Italian places near my home, and great sushi and Japanese are found all over Bangkok. We have a very exotic supermarket in our neighborhood that sells bizarro foods such as cheese, salsa, wine and oatmeal. These imported treats come at a price though – a package of tortillas costs the same as a 12-piece sushi set, about $8. I feel like I have been fairly adventurous with new foods. I’ve tried lava-hot curries, eaten from the dirtiest street stalls, sampled meatballs of unknown animal origin, and I’ve even tried crickets, which are crunchy and salty like a potato chip, in case you are wondering. But, there are some Thai foods that I can’t get behind; I have no interest in trying green tea flavored Kit-Kats, corn flavored yogurt or chicken flavored peanuts. And I adamantly refuse to put corn on my pizza. All this talk of food is making me hungry, but looking inside our fridge I see only soy sauce, beer, leftover pizza and something mysterious that may contain the cure for cancer. It is the fridge of a college freshman. I’ll have to go to one of the many places in our neighborhood to score lunch. In Bangkok, I may not be able to afford a kitchen, but I eat like a king. Green tea flavored Kit Kat – no thank you. Blah Pao – salt covered, grilled fish, stuffed with lemon grass – is one of my favorite street foods. The salt crust holds in the juices and the lemon grass gives it a citrus tanginess. Fresh fruit and vegetables are available at markets all over town. Vats of curry, soups and stir-fry for sell at a street market. 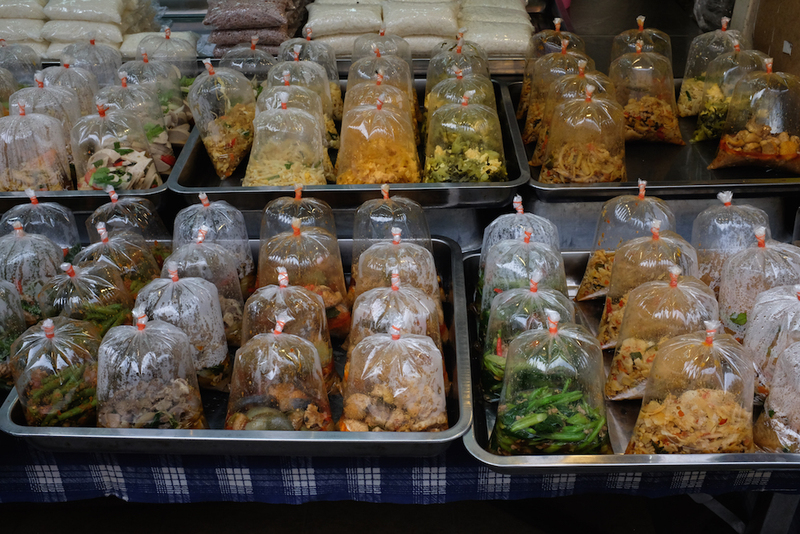 Street food is spooned into plastic baggies for take-away. Prik Nam Blah, or chili fish sauce, is that evil looking condiment on the bottom right of the plate. If the dish isn’t hot enough to burn a hole in your chest, adding this will do the trick. Are you jealous of my food options? 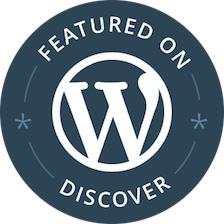 As always, a great blog!! Must try the molten curry!! A great take on expat living, Jeff. I do now live in a foreign country, and also lived in Mexico for two years long ago before they invented thongs and short surf boards. I can’t say that I’m jealous of your food options, as where I live, I can buy just about anything I’d like from anywhere there is, but I am jealous of your prices! I’m glad to see a post with bear spray in it again! I imagine that you have some of the best international cuisine anywhere. I remember eating some pretty awesome things in Dubai, but yeah, the prices were steep. Where did you live in Mexico? P.S. – Thanks for noticing the bear spray reference. I need to drop a link on that. 100% accurate!!! I miss the street food so much! What is the food like in Korea? Good I assume, and less spicy? The prices sound incredibly cheap to an American, but how does it compare when you are looking at a local person’s income? I’d have to skip the molten magma and the bear spray! I don’t think my ulcer could take it. Definitely agree about the kit kat! The street food is still cheap for locals for sure. 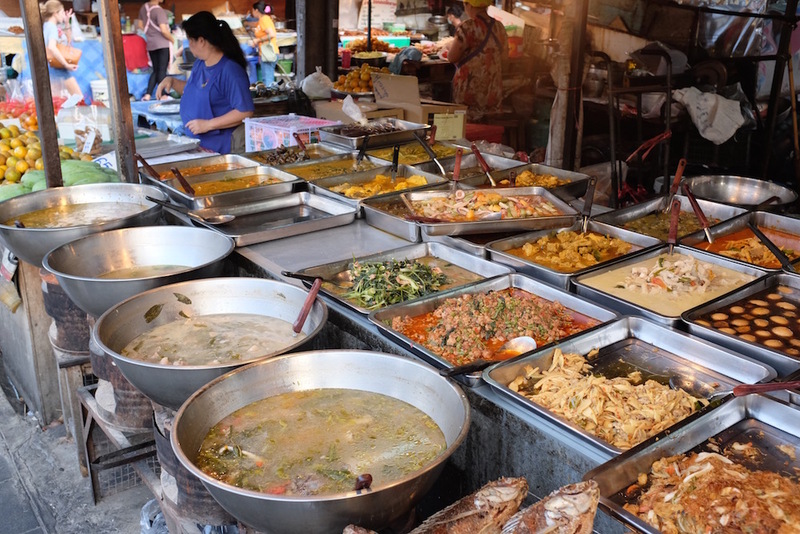 As cheap as much of the food is, restaurants in downtown Bangkok can get very expensive. You only see upper class and tourists in some of those. The Kit Kat seems to divide people. I am not even going to give it a try! Let me start by saying the green tea-flavored Kit Kats are awesome! The color is a bit off-putting, but I swear they taste great. For the past year, I’ve been living in an apartment built for millennials; it has a minimalistic kitchen and not even a full-sized fridge. The assumption is that everyone orders in or eats out, which I’ve been happy to do for this amount of time, but the difference is that everything costs a fortune! I wish I had your local food stalls and tiny affordable restaurants nearby! I like Thai food but wonder if I could take it for months on end – I know for sure the fiery stuff would not work long-term! Very fun post, Jeff. The Kit Kats seem to be a divisive topic! I accidentally got green tea flavored tooth paste once and swore to avoid green tea forever! The other thing that makes the food great is the portion sizes are reasonable. I gained 6 pounds in three weeks in the states when I went home for Christmas! It doesn’t make any sense at all to cook at home here. That makes me a little sad because I do enjoy cooking. In Texas it would be hard to find food for less than $4 to $6 and it won’t be healthy like it is here. Thank you for commenting. Sorry. Did you go find Thai food to eat? But that’s largely because of lack of opportunity. Except for the curries violating my mouth you make me want to go back to Thailand just for the food. We’ve not been as adventurous as we could/should have been over the years for fear of contracting some heinous illness, though we’re finding this visit to Mexico we’re much more adventurous. Love the opening photo. And the way you write! Thank you Alison. I feel like most of the street food is safe because it is so fresh, but at the same time, they often handle money and food without washing hands and wash dishes in murky bins. So far I haven’t gotten sick! I lived in rural Alaska which though it isn’t sometimes seems like another country. I’ve tried many Eskimo delicacies. Oddly enough, it was in Fairbanks that I discovered Thai food and fell in love with it and was the first thing I went for when I came into town from the Bush to shop. Unfortunately, still not available in NW Oklahoma. Rural Alaska is very much like a different country. What were the Eskimo delicacies? Alaska has tons of Thai food. Last year when I visited Denali I saw three Thai food trucks. Thanks you for sharing. We loved the drilled salted fish too. And um, yes, you gotta try the green tea kitkats. I thought they were terrific! Our favorite vegetarian restaurant is Pun Pun, in temple grounds…serving up some spectacular original dishes in an unusual setting. Yes, the variety and diversity of the food here is a real treat. Stir fry, curry, soups, grilled fish, fried chicken, fried meat balls, fruit, som tom made to order, insects – all sold on the street and sold everywhere. I had a look at Pun Pun’s website. I’ll have to try that next time I visit Chaing Mai. Thanks for the suggestion and the comments. Nice shots, full of colour! Your post couldn’t come at a better time. We are leaving for Bangkok on Monday. Of course I’m excited about seeing the palace and temples but I’m honestly most excited about eating and have had green curry on the brain for weeks. The tourist stuff may be spicy enough for me, but I’m up for an adventure in eating. I think the neighbourhood we are staying will be quite authentic. I’ll try to remember not to wear my elephant pants. Yes, where you are staying will be quite athentic I think. Just remember this phrase – My Pet. It means “not spicy.” I had some friends visit from the states and they asked for “pet pet” or very spicy. I don’t know how they did it. Bangkok has some cool things to see, but what I love about the city is the smaller sights – the restaurants under overpasses, the 5 people on a motorbike, the tuk tuks, the Buddhist offerings everywhere. Jeff, Thanks so much for that useful phrase! I am absolutely jealous of the fact that you live in Thailand and get to enjoy the delicious Thai food. Bangkok is one my most favorite cities to visit. Enjoy the experience. I can understand your jealousy 🙂 Thanks for the comments. If you have a fridge, all you need is a gas burner, a wok, and a 1/2 half day cooking class, bro! Either way, your “magma” index will continue to rise. Makes me miss that place. Our kitchen does have a hot plate/wok which is all we need, but it costs me more to cook at home! And it isn’t as good 😦 Just when I think my tolerance for spice is growing I eat something that burns my face and causes me to drink way too much beer. Then, it’s time for a massage! So I have wondered for years – does the food in Thailand taste anything like what we have in the US? I know our food here is nowhere near as hot, but are the flavors the same or similar? Whenever I ask the staff or owners that at Thai places here (we have a huge Thai expat community here) they are evasive in their answers. Great question. In the USA, I tend to stick to the staples like Pad Thai and Cashew Chicken. I’d say those are more or less the same, but one big difference I see is the condiments. In the States we use Sriracha or a chili paste, whereas here they use Prik Nam Blah – fish sauce with slices of hot chili. 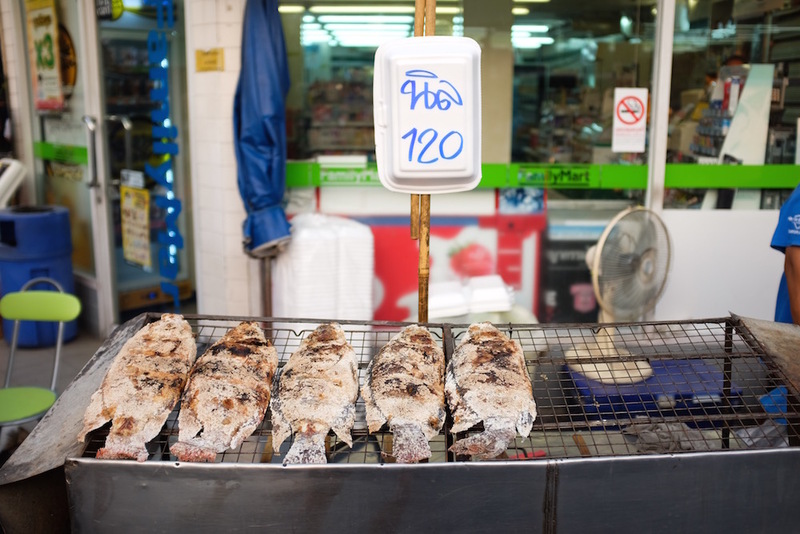 A big thing here is grilled fish, pork or chicken with sticky rice. That isn’t something you’d find in a Thai restaurant back home. I feel like there are lots of noodle soups here you don’t find in the States. You can get a bowl of noodles with a few fish balls in it for about a dollar at a lot of street stalls. This is making me miss the Taiwan night markets! I would have been much happier if all of my friends were like you. They always ask me to buy them green tea Kit Kat every time I travel abroad, wherever it is available. Had they not asked, I would have enjoyed all the green tea Kit Kat myself! Of all the dishes you mention in this post, I want to try that very spicy dish the most. It looks yummy! There seems to be a lot of support for the green tea Kit Kat in these comments, so I guess I have to try one. I had green tea toothpaste in China once and I have been scarred for life. That lady with the spicy dish in the wok has some of the most colorful and fiery looking curries I’ve ever seen. They are works of art. Jeff I can hardly believe how inexpensive the food is. Would I be correct to assume that in touristy places the prices would be substantially higher? Yes and no. In the areas frequented by backpackers and budget travelers, they are higher but not by too much. However, in some of the wealthier and trendier parts of town the prices usually double or triple. A good pasta dish with salmon or something costs about $8 or so. So, like most places, there are higher prices to be found but it is still relatively cheap. I think the other thing is the quality. Even the cheapest food here is very fresh and high quality. The value is maybe the best in the world. Haha we try to do one big trip a year as Dave is still working full time so only so many vacation days. This year it’s Africa. We are going to Zimbabwe to see Victoria Falls but the rest of the time in South Africa including a 10 day cycling trip. Awesome. That will be a great trip. We did that about 5 years ago. Great to hear Jeff. Yes we think it will be an extraordinary experience. Thank you. I saw that you used to live in Thailand and are in Canada now. What foods do you miss the most that you can’t get in Canada? Thank you for this post. I am currently preparing for my trip to Thailand so this post helped to set the tone of what to expect! Thank you. It is a wonderful country. Where are you planning to visit while here? Jeff, one of these days I will have to swing by Bangkok to meet you and Kristi over some street food! The molten magma curry actually looks delicious – I know Bama would eat that with no qualms. Strangely, I feel that my spice tolerance has actually gone down since moving here to Indonesia. I can still eat (and enjoy) spicy food, but I end up breaking out in a sweat much more easily than before. I personally love green tea Kit Kats. Until recently there were orange-flavored Kit Kats and cookies ‘n cream Kit Kats in my fridge, plus I have even tried a wasabi-flavored Kit Kat which was pretty good. I think a distinction has to be made between Chinese green tea (which I don’t like myself – too bland) and Japanese green tea (i.e. matcha). The Kit Kat in question is matcha-flavored so it’s got this smooth, creamy flavor that is wonderfully sweet and not too strong. If you’ve ever tried matcha chocolate or matcha soft serve ice cream, it’s very similar. Okay, I guess I need to try a green-tea Kit Kat. I am still traumatized by great tea toothpaste from my first visit to China so I’ve avoided it. Interesting that you spice tolerance has gone down. I may be the same way. I certainly break out in sweat more easily, but then again it is hot and humid all the time too. I have certainly eaten a record amount of ant-acids this year. 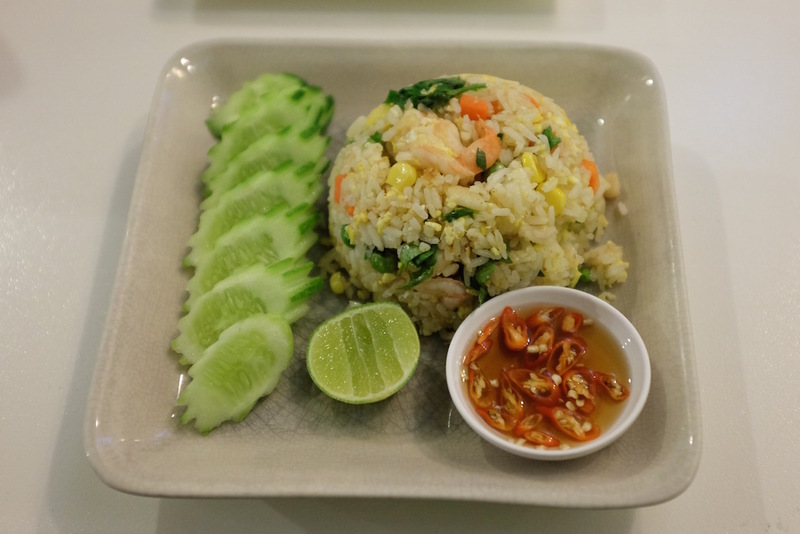 Great blog, recently visited and it brought back the taste of Thailand!! Thank you! The food in Thailand is some of the best in the world. I feel like the green tea Kit Kat will soon make an appearance in Western Europe as a hipster chocolate bar? Some things just shouldn’t be put together! I can see that happening. I actually bought one and am planning to give it a try since so many commenters said it was good. It is so good! It is so simple, filling and healthy, some of the best in the world. What was your favorite dish? I’ll give one a try someday! Thanks for commenting. Your post made me so homesick and hungry for the food I love! My parents were expats in Bangkok for 14 years and I was born and raised there. The street food is the bomb! Ah yes, the food is amazing! I’ve been away all summer and I’m eagerly anticipating a return mainly for the food.